Your free site membership allows you get End-of-Day Email Recaps of your Watchlists at approximately 4:45P CT Monday-Friday. Barchart Premier Members may also opt to receive Market Open (9:00am CT) and Mid-Day (12:00pm CT) emails as well. Your email will provide closing prices, change, and percent change data. Barchart Premier Members may receive their email formatted with any Custom View you create, and select to receive a .csv attachment for import to a 3rd party spreadsheet. Track your favorite symbols with Watchlist emails. 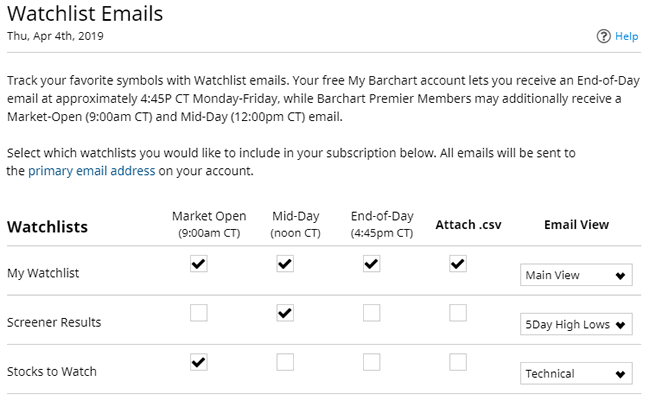 Your free My Barchart account lets you receive an End-of-Day email at approximately 4:45P CT Monday-Friday, while Barchart Premier Members may additionally receive a Market-Open (9:00am CT) and Mid-Day (12:00pm CT) email. Each Watchlist is sent in a separate email. As a registered site user, you can receive the Main View as part of your subscription, which is a quoteboard of the symbols (Last Price, Change, Percent Change, High, Low, and Volume). Barchart Premier Members may choose any available View for the email format, including any Custom View you create. You may also receive a .csv attachment of your Watchlist for import to a 3rd party spreadsheet. This feature provides the ultimate flexibility for you to get your daily recap in the format that best fits your trading style. Note: Barchart will stop sending end-of-day recap emails if your account has been inactive (no login activity) for 6-Months or more.